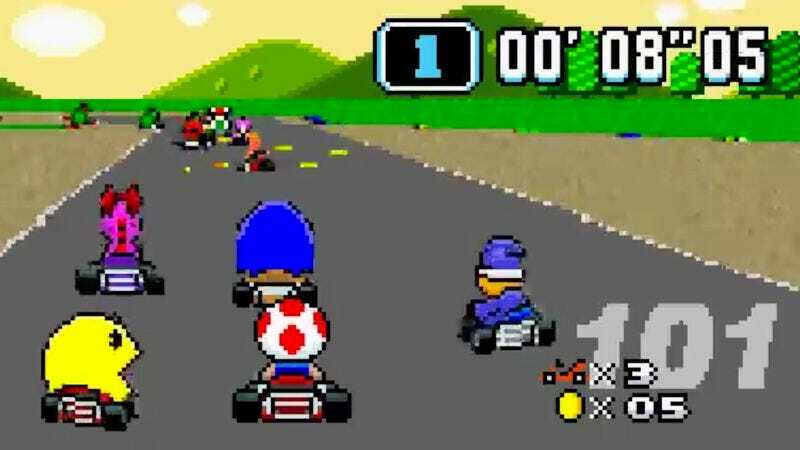 Isn’t it the worst when you have 100 of your closest friends over for an exciting round of Super Mario Kart only to realize that the game only has eight characters, and that the Super Nintendo Entertainment System only has two controller ports? Instead of leaving nearly 100 of your friends out in the cold, they can all play thanks to a strange and beautiful new hack of the game courtesy of Hat-Loving Gamer. While it seems unlikely that 101 players would be able to provide input at once without the computer exploding as it tries to manage all that activity, a video demonstrating the hack does show a single player competing against 100 other characters. Even Mario Kart 8, the most recent entry of the franchise, has only 30 playable characters, so Hat-Loving Gamer had to get creative and pull some racers from other franchises. Characters seen in the above video include a few different Tetris blocks, Spyro, Sonic The Hedgehog, Solid Snake, Ryu, Pac-Man, Goku from Dragon Ball Z, CJ from Grand Theft Auto: San Andreas, Ash Ketchum, and more. Truly, there’s an absurd amount of options. There’s no downloadable version of the game, so those who want to actually give this a go better have some experience with SNES ROM files. If you do have the know-how, Hat-Loving Gamer is making sprite sheets available on his Facebook page. Hat-Loving Gamer is something of a Super Mario Kart modding expert, by the way, as nearly a year ago, he also made a video demonstrating what Mario Kart 8 might look like if it was made for the SNES, and his channel is filled with other videos of a similar variety.